Hannu Rajaniemi’s The Quantum Thief occasionally does this really interesting thing whereby it wilfully undercuts its own hyperbole, often to grand (if a tad saccharine) emotional effect. The greater part of the book’s aesthetic comprises a kind of rampant over-the-top-ness; it’s very, very far-future SF: every character is a quasi-immortal (don’t ask) posthuman, the action transpires on a walking Martian city, nanotech implants enable instantaneous telepathic communication, everything is surrounded by a data cloud called the ‘exomemory’, and the titular thief himself can manipulate physics to steal quantum time off a person’s life. The whole thing is wildly inventive and stylistically zappy: an exuberance only matched by the book’s stratospheric levels of pre-publication hype. But after the umpteenth description of planet-sized this and million-year-old that, your reader began to feel justifiably (I think) exhausted by all the cold techno-babble and sense-of-wonder fetishising of big numbers and weird technologies. I scan my fragmented memory for images. An ice castle in Oort, comets and fusion reactors tethered together into a glittering orrery, winged people chasing them. Supra City, where buildings are the size of planets, domes and towers and arcs rising up to meet Saturn’s ring. The Beltworlds and wild synthbio covering them in coral and autumn colours. The guberniya brains of the Inner System, diamond spheres adorned with the faces of the Founders, filled with undeath and intrigue. The odd thing is that all that feels less real than sitting in the sun with her, pretending to be human and small. So The Quantum Thief willingly destabilises itself; the stylistic status quo of large-scale imagery and high-level geek speak undercut by emotive language to create a kind of contrast or tension, out of which comes the book’s more successful emotional moments. It’s an admittedly interesting technique, but to be honest I can’t decide if Rajaniemi’s reliance on such a thing to create tone and feeling is a brilliantly self-aware critique of hard SF genre proclivities, or just a rank failing of his predominant style. It is, however, unfortunate that such moments are so few and far between, as many of TQT’s descriptive passages are so jargon-filled that I often had no idea what I was supposed to be visualising: a frustration that would undoubtedly have been mitigated by more such bathos as that quoted above. But what’s it all about? Well, for the record, any statement I make about the book’s plot should be assumed to carry a parenthetic “(I think…)”, as the narrative is so fast-paced, confusing and hinged upon terms that the author refuses to elucidate that now – several days after having finished reading it – I’m still not entirely clear on what happens. But here goes… Jean le Flambeur is a master thief broken out of jail by a warrior, Meili, who wants Jean to steal something for her. First, however, they must travel to Mars to steal Jean’s own memories that an older version of himself has hidden away. Meanwhile, also on Mars, Isidore Beautrelet, a gifted young detective, is investigating a conspiracy while guided by a flying law enforcer who dons a top-hat and steel face plate and who goes by the moniker ‘The Gentleman’. It’s not long, unsurprisingly, before the stories of Jean and Isidore intersect. In reality, though, this meagre synopsis doesn’t scratch the surface of Rajaniemi’s inventiveness: there’s the ‘gevulot’ system of perception-based privacy, also the armies of ‘Quiets’ – machines inhabited by the consciousnesses of Mars’ dead (before they’re re-born to live again, that is) – and (a personal highlight), Perhonen, Meili’s flirty, vivacious and sarcastic space ship. It would take several review-sized posts just for me to list, verbatim, the myriad SF weirdnesses that comprise TQT, so let’s suffice it to say that Rajaniemi is mindblowingly creative, and his universe impressively consistent within the remit of a narrative framework in which almost anything goes. The narrative that surrounds the dialogue, however, is consistently brilliant (if, as I’ve stated, frequently confusing), and manages to combine swift pacing with convincing philosophical asides, flitting comfortably between third and first person perspectives without the pretentiousness that such a gimmick often involves. I also enjoyed the sly references to the roots of SF; with the thief/detective dual narrative paradigm functioning as a definite call-back to early 20th Century noir magazines, and the Martian horde of rampaging ‘Phoboi’ a nice nod to the mutant alien swarms of hero-centric SF pulp. Jean le Flambeur himself is equally hit-and-miss in his presentation. His gentlemanly charm and politeness is pleasingly at-odds with his morally dubious profession, and the emotional rawness that comes to the fore as his forgotten past is slowly revealed is well realised. But his irresistible sexual allure and string of in-novel liaisons (even Meili’s space ship falls for him) borders on farcical (and not in a good way); a throw-back to the male adolescent fantasy-fulfilling aspect of pulp SF that I didn’t welcome. 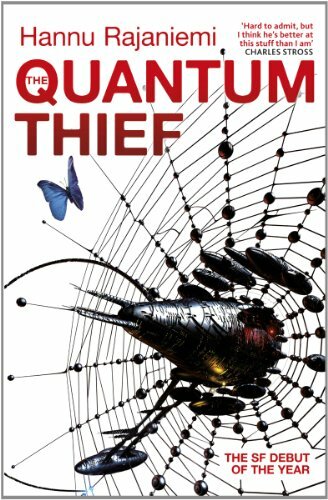 This entry was posted in Novels, Reviews and tagged Hannu Rajaniemi, The Quantum Thief. Bookmark the permalink. I’ve heard of this of course, but not been tempted as it sounded to me that it would likely have precisely the faults your review brings out. I think Alastair Reynolds and Greg Egan have both done novels which burst with ideas and yet perhaps better retain the sense of the human which appears slightly lost here (Charlie Stross’s Accellerando also springs to mind, which of course takes us through the path from us to them and so makes it easier to keep up). It’s a difficulty intrinsic to posthuman SF. How do we relate to beings that not only are no longer human, but that intellectually surpass us? I’m not sure we can, any more than literate cats would relate to the problems of a suburban couple trapped by debt in a decaying marriage. That gap can be surmounted, but it’s not easy to do. If you don’t, the result may be admirably clever, but it’s hard to care. The other thing that put me off was the sheer bloody size of the thing. It’s really interesting in a cutting-edge-of-SF kinda way, and the sheer scope of the guy’s imagination is amazingly impressive, but, as I say in the review, it’s just all so alienating and difficult to follow, that the whole reading experience is necessarily a cold and detached one. Very astute of you to mention Charlie Stross, who apparently is a massive influence/inspiration for Rajaniemi. I agree with your thoughts on the difficulties (should that be impossibilities?) of presenting a post-human intelligence in fiction in a way that resonates emotionally. Many thanks for reading and commenting – always much appreciated.